My 1st Division Lead: As the cruise progressed the ship started flying more alpha strikes into the North Vietnam heart land. To support these missions we needed to put up at least four A-6s for each strike, and typically a pair of tankers, one to refuel the BARCAP (Barrier Combat Air Patrol), F-4s that protected the fleet, and at least one to refuel the TARCAP (Target Combat Air Patrol), F-4s that accompanied the strike. Despite the fact that we had a total of 20 aircraft assigned to the squadron, we typically only had about 18 aircraft that were ever available at any time and 3 to 4 of these would either be KA-6D Tankers or A-6As configured with a buddy store, so they could fly both strike and Texaco missions. Since an alpha strike on anything other than the first launch of the day had at least three aircraft airborne when the strike launched (2 bombers and a tanker), you would generally need over half the available aircraft and about ½ the available crews in order to support the mission. Leading a division of aircraft (4 planes) flying formation on another division was a lot more difficult than maintaining your position as a section leader (2 planes) within a four plane division or leading a 4-plane flight. As a Division Leader everything you do is amplified to your three wingmen. When you drop a wing, they must rotate in space around your centerline. This translates to 10's of feet of rotational motion perpendicular to their flight path. (Note: This is not a rotation on their part. You are rotating, so they must translate to maintain the same formation with respect to your aircraft.) As a Division Lead in an Alpha Strike, you must positioning your four planes relative to the alpha lead’s four planes which are about 1000 feet at 1:30 or 10:30, or 1500 feet at 12:00 depending on whether you are the right, left, or trailing division, respectively. Since we were now four or five months into the cruise and Skipper Hoagy Carmichael, LT John McMahon had left the squadron, we need a few more Division Leaders to support the alpha strikes. LT Jack Keegan, LT Terry Young, and I had all been Section Leaders for the longest time, and we had survived our various ordeals by SAM. LCDR Ken Craig, the Ops Officer, figured we were up the task. I got my turn on a daylight alpha strike to a site about 10 miles south of Hanoi which was described as ‘buried POL’ . The strike was going to be lead by the CAG. This was going to be a very large strike for Navy standards with the lead element consisting of three divisions, in a finger tip formation followed by a second element of four divisions. The whole strike tallied about 25 or 26 strike aircraft. With a background in fighters, CAG would be leading the strike as a 4-plane division of F-4s. The A-6s were in the division on his port side which gave us the best view of the strike group, since we wouldn’t have to be looking through the BN’s side of the aircraft to keep the lead in sight. CAG was infamous with the A-6s on Midway for briefing a sub 500 knot coast in at 20,000 feet and then pushing over to achieve 500 knots in the slow descent to our roll in altitude at 16,000 feet. Somehow strikes always ending up at 525 to 535 knots, outside what an A-6 could do with a full load of 16 MK-82s(500 pound bombs) and a centerline drop tank, our standard Alpha Strike configuration. The F-4s and the A-7s which were carrying less than ½ the load of the A-6s could keep up the speed, but we were always being yelled at for being “sucked” (out of the formation in a trailing position). But I had been dealt this hand, and this was my ‘trial’ as a Division Lead. With the Ops Officer (Ken Craig) on one wing, and the new skipper, CDR Barrish on my right wing, I was going to do my best to maintain the formation no matter what. The alpha joined up over the ship at 20,000 feet with the various divisions joining the strike from the inside of the assembling gaggle and then sliding into their respective positions. The F-4s in the flight typically wanted to be topped-off with fuel on their way in to the target since they had burned a lot of kerosene trying to get their lead-sleds loaded with bombs all the way up into the thin air. With everyone pretty much into position and ready for battle, CAG rolled the group in the direction of the coast line aiming at an area just north of the hourglass which was a lightly defended area. The strategy of the strike was good, the alpha was going to proceed in bound toward Nam Dinh which was a major city and a heavily defended area. Short of the city we would turn north toward Hanoi. The strategy was to confuse the defenses with this ‘faint’ at Nam Dinh and then a bold attack near Hanoi. Since the target was south of that city, we would be flying directly into the high threat SAM zone. Providing we didn’t stir-up anything nasty, we would be roll in to port in a classic fan on the POL giving each division a good steep dive from the roll-in, and then just continue south and east to ‘feet wet’. We crossed the beach and true to form CAG accelerated to his 525 knots, but I had been flying as a wingman for months observing this behavior, and watching as some of our Division Leaders had started getting sucked. Since the first leg before the starboard turn north was relatively short, I just started the turn early turning way inside the strike groups radius of turn. By the time the strike group was heading north I was able to slide neatly into my slot ready for the forthcoming roll-in to port. The ECM gear started chattering before we had reached the turn at Nam Dinh. As we approached Hanoi more and more sites joined in the course. The greater Hanoi area was well-defended with anti-aircraft artillery (AAA) and surface-to-air missile (SAM) sites. Our strike group of well over 20 aircraft had gotten their attention, and they were certainly going to take a shot at us, if at all possible. At about that time the APR-27 went off with an indication that a SAM had been launched somewhere. At this point we were at roll-in and this was not as much of a problem unless you were the target; the roll-in maneuver nominally a 40 degree dive with a terminal speed of somewhere around 600 Knots just prior to the 5500 foot release altitude was a great evasive maneuver for a SAM. Once you got the bombs off the A-6 you were in a great position to out-turn a SAM. I wasn’t too anxious at roll-in and established a near perfect 40 degree dive on the target. The pressure of combat was nowhere near the pressure of staying in the formation with my flight. (You didn’t worry about dying; but you never wanted to look bad.) I was generally pleased with the way I had handled my first Division Lead. It is then I realized I had forgotten one rather important thing. Despite leading and flying a near perfect flight, I had failed to turn on the gunsight. So there we were going downhill very fast with John calling out the passing altitudes and I’m fumbling around on the center console trying to locate the switch for the gunsight. Passing something like 7500 feet I decided to give up on the gunsight and took a look through the clear combining glass of the sight at the ground rushing up at us. When an Alpha Strike attacks a target each division in the strike rolls in as a unit. For three elements and a port roll-in the division on the lead’s port wing rolls in first followed by the lead division, and then the division on the starboard wing, our division. For this roll-in we were the last division of the first element, and by the time we were getting to the release altitude the bombs from the first division were already detonating. I could see the vapor trails from the wingtips of the lead F-4s, as they put on the Gs, but the bombs from the first division were already exploding on the ground. We had all fused the bombs for long fuse delays, so the bombs would penetrate some of the soil before exploding. The bombs hitting the ground were sending up plumes of fire as they touched-off the buried POL. By the time I reached our pickle altitude all I could see in the gunsight was a huge fireball as the bombs from the lead division hit their mark, as well. Even without the gunsight, I couldn't miss, this must have been a huge cash of fuel. Once I got the nose above the horizon on the pull-out I started jinking, bending our flight around to an easterly heading. The ECM was still going off in our headsets, but at high speed and low altitude AAA was the only thing we typically had to worry about. During the egress the division typically stayed reasonably together as two (2) two-plane sections. Each section flew a weaving flight out of sync with each other. By so doing each aircraft was able to clear his wingie’s 6 o’clock, just in case the crafty North Vietnamese had sent up a Mig or two to pick-off stragglers. We followed a direct route to feet-wet attempting to egress at about the same point as we had ingress. During the flight toward the coast we could see the smoke rising nearly vertically from the target area. Our flight of A-6s joined up, reported feet wet to ‘Red Crown’ , looked each other over, and switched to Midway Approach Control. Our traps were uneventful, but by the time we had parked the aircraft and deplaned, the smoke from the POL was visible from the deck of the carrier. Midway at this time was at the North Yankee Station around 50 nautical miles (nm) off the coast, and the target was another 70 or so nm feet-dry, so from about 120 nautical we were able to share the result of the strike with our plane captains and the Midway's flight deck personnel. These guys were contributing to the war effort working 16-hour days for weeks on end and sleeping in four-high racks in poorly air conditioned spaces. They very seldom saw any of the effects of their labor. This day was different, we could point at the vertical column of smoke, and they could see their direct contribution to the war effort. And . . . . . I had passed my test as a Division Flight Leader and I was now qualified to actually lead an Alpha Strike, as well. 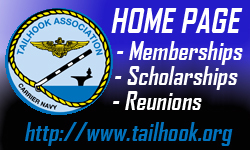 Editor’s Note: If you too would like to have your story posted here on The Tailhook Daily Briefing, simply email me your article. Don’t worry about grammar or images (although provision of both would be appreciated…) I can help in those departments.